Ban's Son in Law Disappears from UNOPS as “Furniture, Parked in New Jersey"
UNITED NATIONS, March 14 -- From the time Ban Ki-moon began as UN Secretary General, the Press has raised questions about promotions given to his son in law Siddharth Chatterjee, who jumped to being the chief of staff to Staffan de Mistura in Iraq, then made Middle East chief at the UN Office of Project Services in Copenhagen. The UN at first tried to argue that these were not in fact promotions, and then openly refused to answer questions on the topic from Inner City Press. Now, sources at UNOPS in Copenhagen and elsewhere say Chatterjee is leaving his UNOPS position, where he was described as “the furniture” for lack of aptitude. When Human Resources, run for UNOPS by the UN Development Program, asked for basic information from Chatterjee for example about this educational credentials, the information was never given. Sources long close to Chatterjee say that the military degree in India has has listened is not what it appears to be, and that an earlier marriage in that country was ended and largely erased from the record by extraordinary means. “It's not clear how much the Bans know about it,” says one source, adding that missive have been sent to Mr. Ban himself. Now, according to the UNOPS sources, as Ban seeks a second terms as Secretary General, Chatterjee has been “parked” out of the way in southern New Jersey, getting basic math education paid for by the UN system. “They're trying to keep him out of sight, after his exposure as 'The Furniture' at UNOPS,” says the source. It would be nice to have and include Team Ban's response, but his spokesman Martin Nesirky, like Michele Montas before him, openly refused to answer questions about Ban's son in law Chatterjee. Chatterjee has threatened web sites with legal action for writing on these topics, then had articles removed from the Internet. Previously, the South Korean mission was deployed to try to provide assurances, then denied it. Now what? Watch this site. I am away till 31 May 2011 on Special Leave. Andy Menz is the OIC for EMO and can be contacted at his e mail... The new Regional Director for EMO is expected to be in place in September 2010. Presumably he means 2011 when he will be replaced. The “Special Leave” continues. At the March 14 UN noon briefing, Inner City Press asked Ban's deputy spokesman Farhan Haq to confirm that Ban's son in law is on Special Leave and in New Jersey. "You have to ask UNOPS," Haq said. After a follow up, Haq said Chatterjee "ended his involvement with UNOPS several months ago." Inner City Press, quoting from Chatterjee's e-mail auto responder about Special Leave, and sources, asked yes or no, is he still being paid. Inner City Press pointed out that it is also a S-G issue, given the questions that have been raised -- and not answered -- throughout Ban's first term. Haq refused to answer, insisting that Inner City Press must "ask UNOPS." Video here, from Minute 7:10. This is more than a little strange, in that UNOPS' web site lists Farhan Haq as the contact in New York for media inquiries - click here. Inner City Press: I wanted to ask you a question about the son-in-law of the Secretary-General. It’s been, he is no longer, currently he is on special leave from UNOPS [United Nations Office for Project Services] and people there say that he has been, they say that it is unprecedented; that he’s been sent to the United States and having introductory level classes paid for by UNOPS. Is that, is that the case? Can you confirm that and what, why would that be? Acting Deputy Spokesperson Haq: I actually think you’d have to ask UNOPS whether there is any such thing. What I am aware of is that Mr. [Siddarth] Chatterjee has indeed ended his employment, his involvement with UNOPS, and I believe he did that several months ago. Beyond that, you’d have to check with the UN Office for Project Services. Inner City Press: Can I just ask one follow-up? Because his reply e-mails, because I was seeking comment on this, says that he is on special leave until 31 May 2011. Could you just confirm, yes or no, that he is still being paid until that time? Acting Deputy Spokesperson: It’s not for me to confirm what UNOPS does. You need to ask them. Inner City Press: Given questions that have arisen about, I mean, questions have arise through his first term concerning this. I think it is a fair question. Acting Deputy Spokesperson Haq: No, no, Matthew; that’s not the case. The case is that with every agency, questions about their employees would have to go to that agency. So, please, deal with UNOPS on that. Update of 2:30 p.m., March 14 -- Inner City Press has now sent a first round a questions to UNOPS in Copenhagen. Watch this site. Inner City Press: I asked a simple question whether the son-in-law of the Secretary-General was still being paid by UNOPS, [United Nations Office for Project Services] as well as whether his educational things may be being paid. Farhan [Haq] said, “Ask UNOPS”. So, I sent them an e-mail, I don’t have an answer, but I also notice that Farhan is listed as the New York Spokesman for UNOPS on their web page. So, I just, I think you may… maybe you have an answer to it and so then all of this is now moot, but, what is the answer? Spokesperson: It is, Matthew. First of all, UNOPS will probably be sending you the e-mail saying what I am going to say, which is that Mr. [Siddarth] Chatterjee left his position as UNOPS Regional Director for Europe and the Middle East in July 2010 and, after taking accumulated annual leave, went on special leave without pay until 31 May, of this year, 2011. The end of the special leave without pay coincides with the end of his period of secondment to UNOPS from UNICEF. And during his special leave without pay, Mr. Chatterjee does not receive any payments or funding from UNOPS. 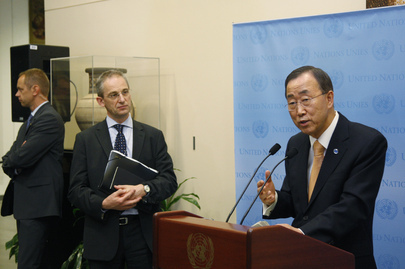 And for your information, a new Regional Director for Europe and the Middle East joined UNOPS on 4 October 2010. That’s what I have for you, okay. After that, Inner City Press sent there follow up questions to Haq and Martin Nesirky. Hello. Yesterday I was told to “ask UNOPS” about the S-G's son in law and I emailed Copenhagen questions (although Farhan Haq is listed as New York contact for UNOPS). 1. 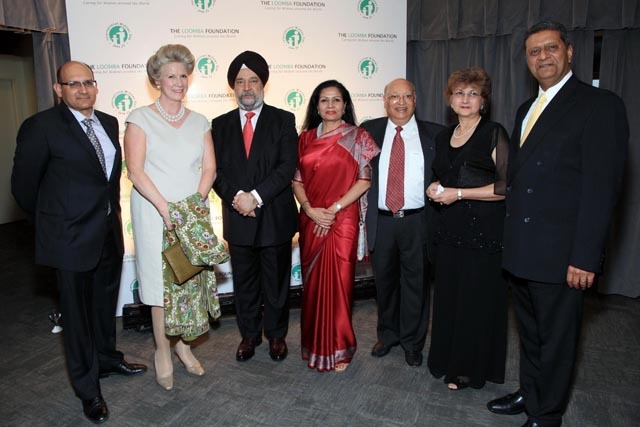 You said that Chatterjee is on leave without pay until May 31, 2011, when his secondment from UNICEF runs out. Will be remain in the UN system as a staff member after May 31st? 2. UN staff rule 5.3(a)(i) says that "Special leave may be granted at the request of a staff member holding a fixed-term or a continuing appointment for advanced study or research in the interest of the United Nations, in cases of extended illness, for child care or for other important reasons for such period of time." For what reason did the UN approve leave without pay for Chatterjee? 3. Who made the decision to place Chatterjee on leave without pay? UNITED NATIONS, March 13 -- A UN Secretary General asks for the support of UN member states, not only to endorse his programs but also, as is the case these days with Ban Ki-moon, to vote for a second term. Should there be rules governing how he goes about lobbying for this support? Haq said, "I am not aware of the family relationships of the people I just named. I only just got this list."